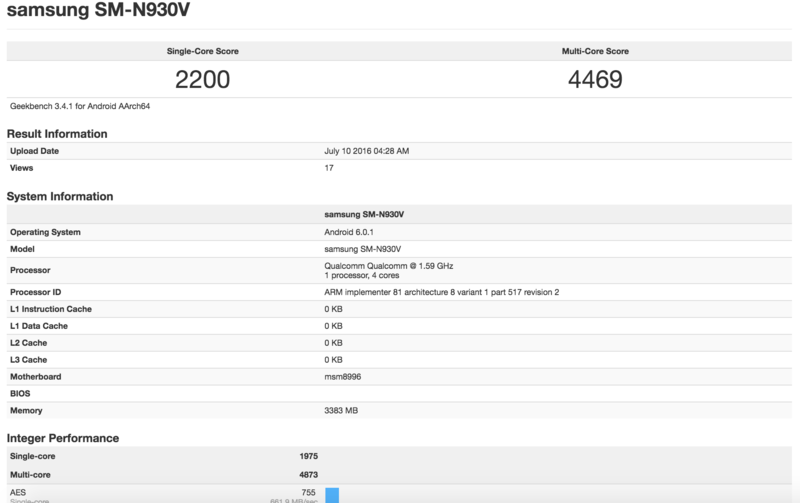 The SM-N930V has now surfaced on the internet as the smartphone's Geekbench results have just been revealed. In case you didn't know, the N930 is the model number of the upcoming Galaxy Note 7 and the V at the end stands for Verizon, as always. The results reveal a few things, but the most significant and slightly disappointing fact which it unveils is the SoC of the upcoming device. It seems like the Samsung Galaxy Note 7 will be using the same Qualcomm SD 820 chipset as the Galaxy S7, and NOT the rumoured 821/823 chipset. The device also has just 4GB of RAM, instead of 6GB, which it is largely expected to have on release. Now, there are two theories about the disappointing CPU and RAM seen here. The first theory suggests that this is just a test unit which is being used to test out the networks on Verizon and the final version will sport the SD 821/823 SoC and 6GB of RAM. The second theory states that there will be both 4GB versions with the Snapdragon 820 processor and 6GB versions with the enhanced processing power. We will just have to wait to find out for sure when the Samsung Galaxy Note 7 is released on August 2.